With Mixed Authentication, you may use 2 different authentication types in your Bizagi solution. Mixed Authentication is the common choice in projects which have users from more than 1 domain, mainly because in such scenarios there are users which do not belong to the same corporate domain as back-end employees (e.g. Lawyers participating in Credit Request Processes in a Bank). For instance, if your project is to be accessed from the Intranet by a certain type of users, and from the Internet as well by another set of users, you may configure Mixed Authentication using both Windows Authentication and Bizagi Authentication. Through this approach, Intranet users could authenticate using Windows Authentication, and Internet users could authenticate by Bizagi Authentication type. With Mixed Authentication, you will need to set Bizagi Authentication as one of the 2 authentication types. For further information, refer to Bizagi Authentication. 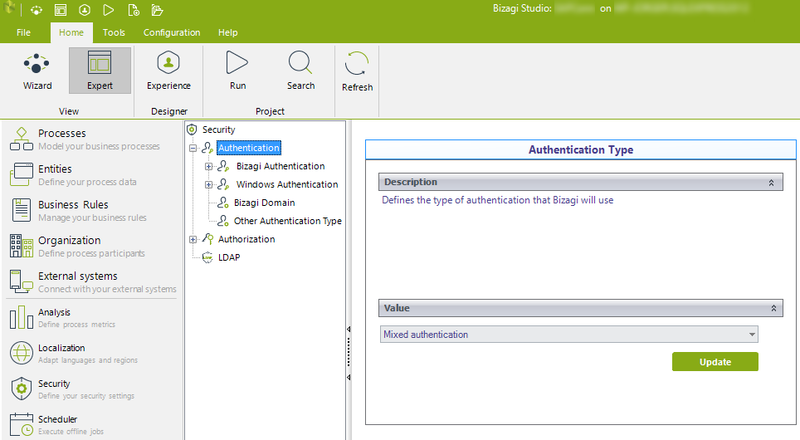 The other authentication type can be set to either: Windows Authentication, or Custom Authentication (applies to Bizagi .NET). For more information refer to Windows Authentication. For more information refer to Custom Authentication. When using Windows authentication in the Mixed authentication, note that Windows will have priority over Bizagi authentication (meaning that Windows credentials are automatically first identified for log in). •Bizagi Authentication: Its inner options may be configured the same as when using Bizagi Authentication. •Bizagi Domain: Specify the name of the domain for the users who will be authenticated using Bizagi Authentication. •Other Authentication type: Select which other type of authentication will be used (Windows or Custom). Further configuration is presented according to the second type of authentication to be used alongside Bizagi Authentication in the Mixed Authentication. Therefore, when updating the Other type of Authentication option, you will have to configure either the Windows or Custom Authentication inner options (in the same way as you would do when choosing Windows Authentication or Custom Authentication).